Early challenge: Paul Early and his Ballintubber team-mates will be looking to keep things tight at the back on Sunday against St Brigid’s. Photo: Sportsfile. They knew they didn’t do themselves justice last year when they crashed out of the Mayo Senior Championship at the quarter-final stage and Ballintubber used that loss as motivation to drive them on this time around. Having to watch from the sidelines as their near neighbours and rivals Castlebar Mitchels went all the way to the All Ireland final itself in March, must have been hard for the men from Abbeyside after they limped out of the championship at the hands of Knockmore in the last eight. However, this year they came back with a ban, and three weeks ago, they claimed their third Paddy Moclair cup in five years when they saw off Castlebar Mitchels in the final. On Sunday, they have the chance to finally make a mark on the provincial stage, which they have failed to do in each of their two previous outings in the Connacht competition. But it is not going to be easy. First up on Sunday is the five-in-a-row Roscommon champions St Brigid’s. The men from Kiltoom are old hands at this competition now and, having tasted the ultimate success in 2013 when they won the All Ireland title, will be chomping at the bit for another drive towards a St Patrick’s Day showdown. Success has become a habit for St Brigid’s with 10 of the last 12 Roscommon titles claimed by them and a three-in-a-row in Connacht, bookended by their famous win in Croke Park on St Patrick’s day last year. It’s the kind of pedigree that would make most teams buckle at the knee. But this Ballinutubber team are made of stern stuff and they can take inspiration from their big rivals, Castlebar Mitchels, who went into the lion’s den last winter and took St Brigid’s Connacht crown at the end of a titanic struggle in the rain in Hyde Park. Benny O’Brien took over from Kevin McStay after Ballina exited stage left following their All Ireland final win, but Liam McHale stayed on and is still a selector with the team and a pivotal member of their backroom set-up. Players like Frankie Dolan, who won his ninth Roscommon title in their latest win, are still to the fore for St Brigid’s, alongside the likes of Karol Mannion, the Kilbride’s Ian and Senan and a host of other familiar names. But there has been plenty of change in the ranks too, with more than half-a-dozen different players starting their most recent triumph at home from the side that brought Andy Merrigan back to the banks of Hudson Bay on the Shannon. 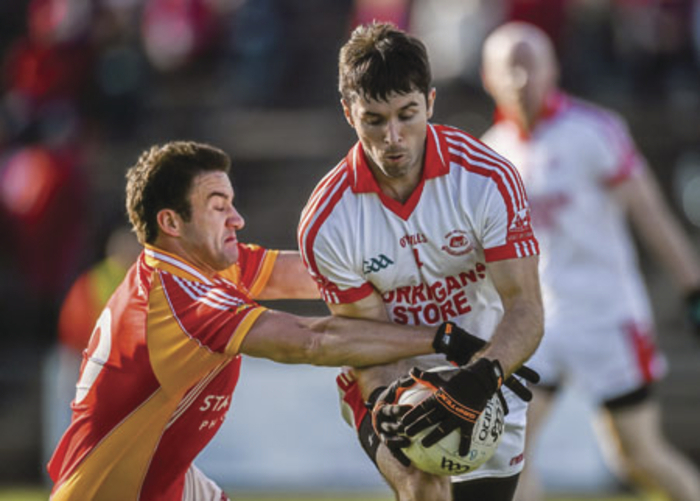 Ballintubber aren’t going to be bothered by big names in their opposition’s starting line-up, as they possess one of the most potent attacks in club football, with Cillian O’Connor the latest All Star from the club spearheading their attack. Alongside his brothers, Padraig and Diarmuid, they will ask serious questions of the St Brigid’s defence. Leaving aside those three, the cerebral footballing ability of Alan Dillon on the 40’ is another problem the Roscommon men will have to try and resolve. Dillon put on a masterful display in the county final and his ability to pick out passes and consistently make the right decision, even if it’s just laying off a pass, rather than trying to force the matter, is the fulcrum of what makes Ballintubber tick in attack. Their midfield pairing of new recruit Stephen Broderick and Jason Gibbons, has the perfect mix of physicality and athleticism that will cause plenty of problems for the Roscommon champions. Peter Ford and Tony Duffy have done a lot of work this year with their charges and, last Sunday, they claimed the league title with a win over Charlestown to cement their position as the unquestioned top dogs in Mayo football. The next step for them is the top spot in Connacht and after that, well that’s next year’s target.